On the D&M Collectibles website you will find a nice assortment of autographed baseball values. The website states that D&M has over 250,000 products in stock and that they have established autograph deals with over 2,000 professional athletes. Autographed memorabilia is the main product found online at this time. The website is still under construction, so only a limited amount of product is currently available. The company, which opened for business in 1999, has a physical location in Lake Villa, Illinois, which is a short drive north of Chicago. They pride themselves on service and product quality. Personal attention to customer needs and desires is a cornerstone of their service policy. 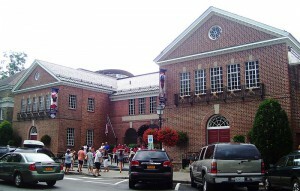 I have visited the National Baseball Hall of Fame in Cooperstown, New York two times. The museum, which is filled with MLB baseball memorabilia, was the highlight of my visits. There are three sections making up this baseball shrine: the actual Hall of Fame, which honors elected members, the museum and a research library. This is the hall’s 75th year, so it has been a year of special celebrations and events. In this review, I will share our impressions of the hall, highlight a few special areas of the museum, and note some of the changes that have taken place since I was there.